A UCL-led satellite mission designed to monitor changes in polar ice cover launched successfully on Thursday 8 April from the Baikonur cosmodrome in Kazakhstan. The European Space Agency's CryoSat-2 will measure the thickness of Arctic and Antarctic ice with unprecedented accuracy and tell scientists how melting polar ice affects ocean circulation patterns, sea level and global climate. CryoSat-2 chief scientist Professor Duncan Wingham (UCL Earth Sciences), who is based at the Centre for Polar Observation and Modelling at UCL, first proposed the satellite in 1999. He said: "Satellites have transformed our knowledge of what is happening to these distant and uninhabited parts of the planet. CryoSat-2 will help unravel the consequences of the dramatic changes in the poles that we've seen in the past two decades." CryoSat-1 failed to launch in 2005 but Professor Wingham and his colleagues say measurements from its successor are crucially important for scientists at the National Centre for Earth Observation, who are at the forefront of monitoring Earth's changing ice cover. 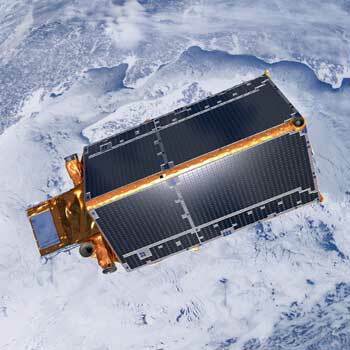 CryoSat-2 will use an instrument called an altimeter to measure ice thickness. This works by recording the time it takes for pulses of microwave energy fired down at the ice to return to the satellite. Scientists can use the difference between how long it takes for the echoes to return from the top of ice floes and from the water in cracks in the ice to calculate how thick the ice is. Significant retreats in summer Arctic sea ice in recent years means there's also more potential for winds to 'spin up' the Arctic Ocean. This could change ocean circulation patterns far beyond the Arctic - as far as the North Atlantic. Changes here could affect the UK's weather. CryoSat-2 will tell scientists how winds affect the Arctic Ocean by measuring changes in the height of the sea surface exposed between ice floes. A second antenna will measure the ice's shape to tell researchers about slopes and ridges at the edges of the great Antarctic and Greenland ice sheets. This is important, because the edges are where the fastest changes are taking place. CryoSat-2's ability to monitor changes at the poles will surpass the abilities of earlier ESA satellites - its radar has been specifically designed for the task and its orbit will cover much more of the Arctic and Antarctica than has previously been possible. Click on the player below to hear a podcast in which Professor Wingham discusses the importance of CryoSat-2. For more information about the mission follow the link above.